When I was younger, so much younger than today, when life was a party all the time, when the responsibilities were somewhat blurred, I loved to sleep a lot. When I first moved in with N, I was 20, and I was in the university. I started my first job, because we wanted to be independent and free, and my working hours were flexible. I didn’t have a problem to work all night, then go to the University, then have coffee with friends, and then sleep. A lot. Like for 12 hours straight. Life was easy. We were living for the moment, Carpe Diem. Ever since I graduated from the University, I started working full time. And the adaptation to the real life was tough. I was still trying to go out on weeknights, but waking up everyday at 7 AM and going to work where I had to be serious and concentrated was so much harder. And having time to sleep for 12 hours to compensate became almost impossible. My life is very different now. I have a full time job. I work a lot and I no longer go out like I used to. But I still don’t get enough sleep. I am most active after sunset and the result is that I barely sleep 6 hours during the week. But from time to time, I just put everything else on hold and sleep. I told you all this because it is Sunday, I just woke up, and it’s noon. I slept 11 hours. And it feels good! A lazy Sunday is something everyone needs from time to time. So make the time for whatever pleases you now and then! Not only you will feel better but it will give you strength to deal with life. Cheers to a lazy Sunday! On the other hand, back to baking, I made white bread this week. I love making yeasted treats. Yeast is somewhat magic to me. And nothing compares to the smell and the taste of a yeasted treat, straight out of the oven. It is not difficult, it just requires a little patience, which no one knows better than me that can be hard, but it is worth it. I realize now that I have posted only two recipes with yeast, but this will change, I promise. 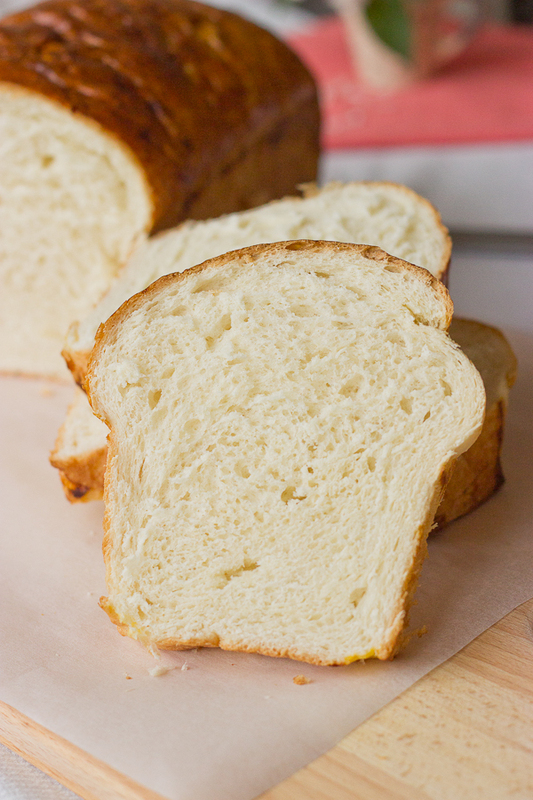 This white bread needs only 20 minutes active work and some time for the yeast to do its magic. But the result… It’s magnificent. 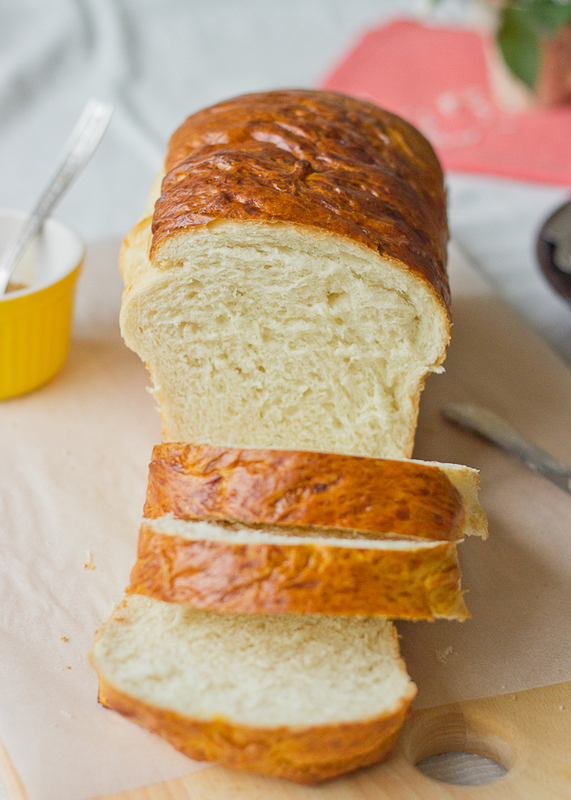 This bread is million miles away from the store-bought and it stays perfect for at least three days. In Bulgaria the white bread is a must. No meal is complete without it. 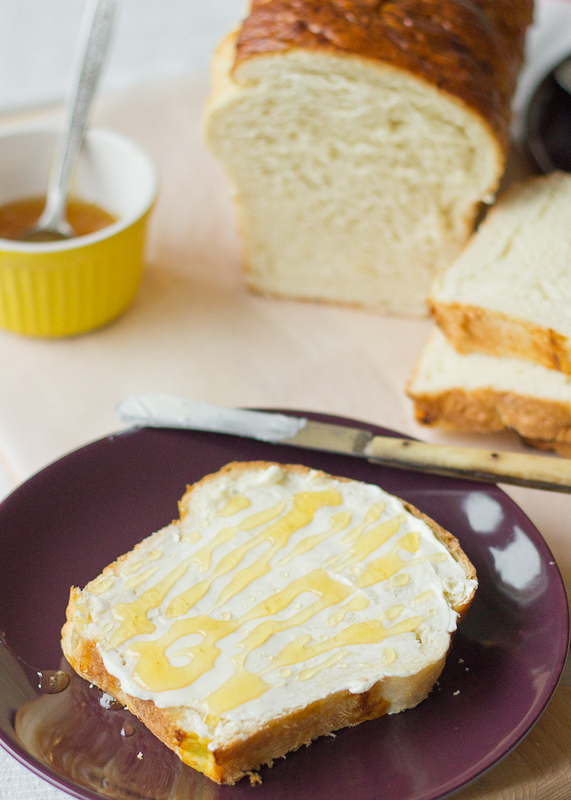 When I was a little girl my grandparents used to make me a slice of white bread with butter and honey for breakfast. So simple and so good! I know that nowadays we eat a lot of complicated dishes, but going back to the basics is comforting and refreshing. 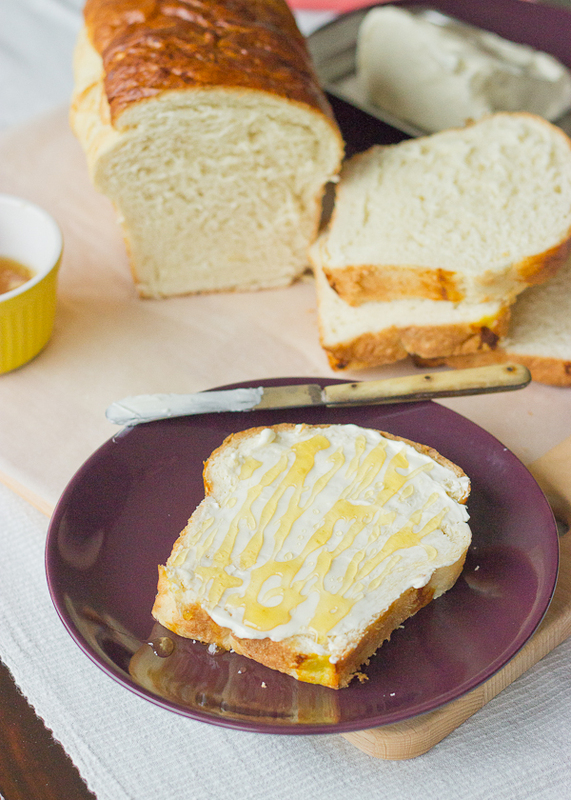 Life can be as simple as bread and butter. Recipe adapted from Bo Friberg. 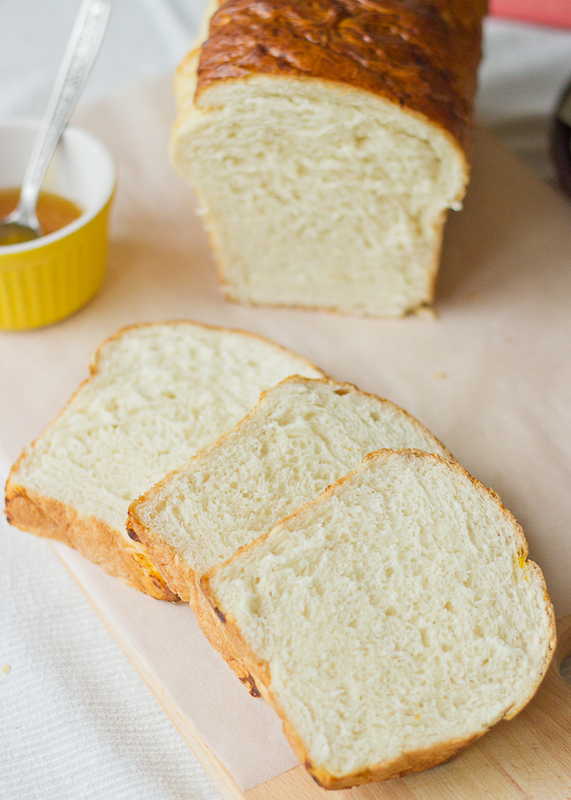 Basic White Bread that is a million times better than store-bought and needs only 20 minutes active time. The bread is so soft and delicious, no one will believe you made it. In a large bowl dissolve the yeast into the milk. Add the flour, sugar, butter and salt. Using a wooden spoon mix the ingredients until a dough forms. Place the dough in a lightly floured surface and start kneading. Your dough should be soft and not sticking. If it sticks to the surface you can add one tablespoon of flour. Knead for approximately 15 minutes to develop the gluten. You need to achieve a dough the is soft and elastic. The best way to find out if it’s done is to take a small ball of dough and pull it gently between your hands, it should not tear, but stretch and form a see-through layer. Grease a large bowl and place the dough in it, turning once to coat all sides. Cover with plastic foil and leave at room temperature until double in size, anywhere between 30 to 60 minutes, depending on the temperature. 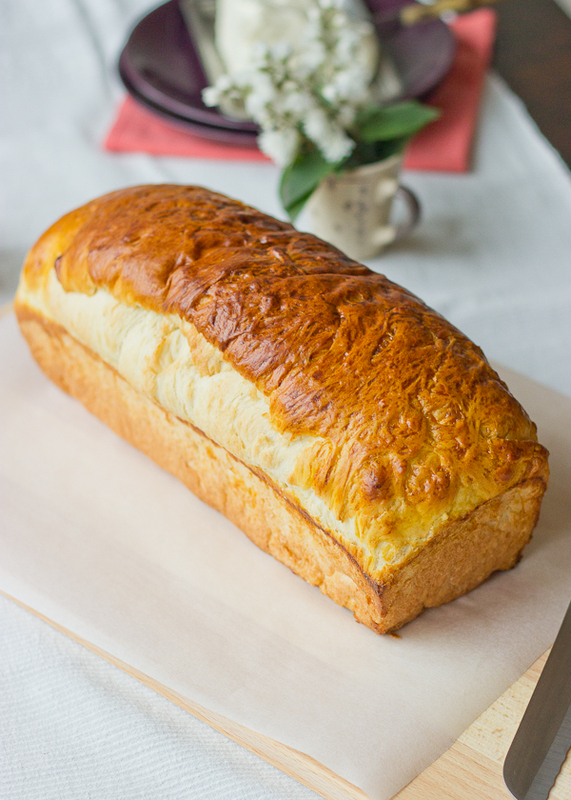 Meanwhile, butter and flour the sides and bottom of a loaf pan, 30 cm./12 inch long, 11 cm./4 inch wide, and 7 cm/3 inch deep, the measurements of the pan are approximate. Preheat your oven to 200°C/400° F.
Take the dough out of the bowl and press it gently on a floured surface. 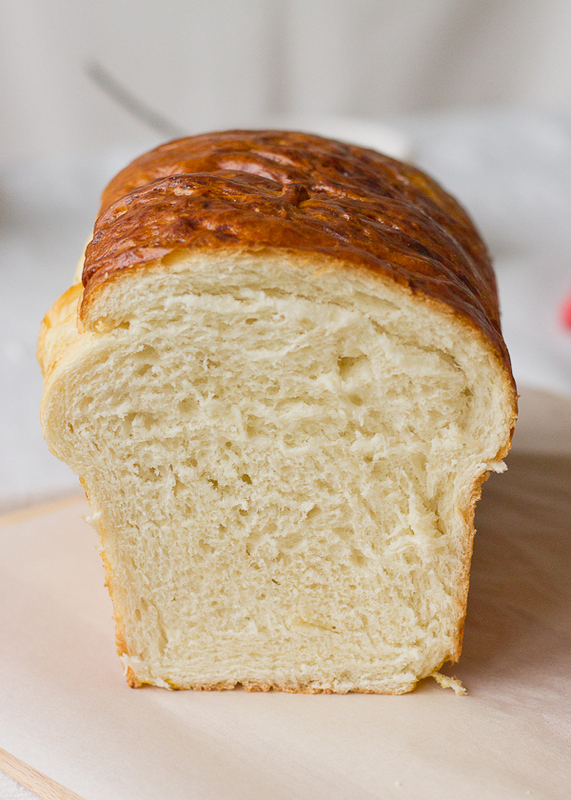 Knead for 1 minute and form a loaf to fill your pan. Place it in the pan and glaze it with a little of the egg yolk mixture. Cover and let it proof for a second time, until almost double. Glaze it again with the egg yolk and bake for 30-40 minutes, until a toothpick inserted into the center comes out clean. Let it cool in the pan and enjoy! Just have one doubt… Milk needs to be warm? Thanks! Hi, Cuca, thank you for the kind words! Regarding the milk, the original recipe states the use of cold milk, so you don’t force the yeast. I used milk at room temperature and the result was wonderful. I will update the recipe. Thank you! Thanks!! I’ll try this one, it’s really easy!